Back in 1995, Kevin Garnett kicked off the modern-day craze for high school hoopsters which culminated in the drafting of Dwight Howard. Thereafter, the age restriction was instituted and the heyday of 18-year old NBA players was over. Of course, astute observers back in 1995 were quick to note that Garnett was kicking off a modern-day craze. Two decades earlier, Darryl Dawkins and Moses Malone had provided a brief breach in the NBA’s college firewall. But if you want to go back, I mean waaaaay back, into time you’ll see that in the NBA’s very beginning it was using straight-from-high-school players. Tony Kappen and Connie Simmons may have been first, but most prominent was Joe Graboski from Chicago, Illinois. Unlike most players who’ve subsequently done the HS to NBA jump, Graboski had no spectacular talent that rendered college useless. Instead, Graboski had dropped out of Tuley High School and did some time playing in the industrial leagues common in urban areas at the time. The 17-year old Graboski eventually got a job as a the ball boy for the BAA’s Chicago Stags. At 6’7″, Graboski was a bit hard to miss and after watching him take some shots, John Sbarbaro, president of the Stags, inquired over whether Graboski might consider joining a local university and after some polishing he might join the Stags. Graboski informed Sbarbaro of his academic situation and the Stags president immediately signed him to a deal. The raw Graboski would play sparingly for the Stags, which became a founding member of the NBA the next season in 1949-50. But what turned out to be the NBA’s 1st season was the Stags’ final. The franchise went asunder and its roster was dispersed via draft to the rest of the league. Graboski wasn’t one of the players taken and went off into the basketball wilderness. The bench-warmer scrounged up some hoops work in 1950-51 with the National Professional Basketball League. The two squads he played for, the Kansas City Hi-Spots and Louisville Alumnites, both folded mid-season and it might’ve appeared the forward’s days a pro were numbered. But prior to the 1951-52 NBA season, Graboski was picked up by the Indianapolis Olympians, desperate to replace their lost star big man, Alex Groza. Although not completely replacing Alex the Great, Graboski certainly provided Indy with more than they could have hoped for. The Indianapolis Olympians clinched a spot in the playoffs by whipping Milwaukee, 95-80. Joe Graboski and Bob Lavoy scored 50 points between them as the Olympians made sure of third place in the Western Division. In the postseason, Graboski upped his regular season averages of 14 points and 10 rebounds to 23 points and 11.5 rebounds. Unfortunately for Indy, they faced off against the dynastic Minneapolis Lakers who swept them in the best-of-3 opening round. Coming back the next season, “Grabbo”, as he was affectionately called by teammates, was the same ol’ same ol’ with 13 points and 9 rebounds a game. In fact, over the ensuing 6 seasons he averaged 14 points and 9 rebounds. He was dependable like clockwork for gritty buckets and rebounds. Also, in same ol’ same ol’ fashion, the Olympians were bounced in a 2-0 sweep by the Lakers. And in a final same ol’ same ol’ development, the Olympians folded after that sweep. In just 5 professional seasons, Graboski had played for 4 squads each of which folded. This time, though, Graboski wouldn’t wander the minor pro leagues for a lost season. Instead he was now snatched up by the Philadelphia Warriors in the dispersal draft. Graboski would no longer be his team’s best player, which was for the best, but he fit in perfectly on an emerging power. Powered by Neil “Gabby” Johnston, the Philadelphia Warriors were a team simultaneously on the rise and on the decline in 1953-54. One-time standout Joe Fulks was on his last legs. The amazing Paul Arizin was stuck in the Marine Corps and point guard Jack George was the only player besides Grabbo and Gabby worth his playing time that season. The Warriors limped to a sad 29-43 record. The next season – with Arizin’s return and Fulks’ retirement – the Warriors improved a few games (33-39), but in 1955-56 the squad finally hit their stride with the addition of swingman Tom Gola. The five man unit of Arizin, Graboski, Johnston, George and Gola ran roughshod over the NBA that season finishing with a league best 45-27 record. Dismissing Syracuse in a slugfest in the Eastern Division Finals, the Warriors took on the Fort Wayne Pistons for the title. Graboski, seven-year veteran of pro ball, scored 29 points, to help usually high-scoring Paul Arizin with the offensive load before 11,140 fans who braved rain and snow to pack Convention Hall. Gola, the All-American from LaSalle playing his first year in the NBA, paced a third-period surge that enabled the Warriors to soar from a one-point halftime lead to a nine-point bulge at the three-quarter mark. Winning that Game 5 won the Warriors the title. But that Warriors core truly lasted only one season. Gola was pressed into military duty the next season (1956-57) leaving the Warriors without their Swiss Army knife on the court. They lost to Syracuse in the opening round of the 1957 postseason. The next season (1957-58), Neil Johnston basically destroyed his knee in a preseason game. He was able to play a few games later in the season, but was a shell of himself and retired. The Warriors eked by Syracuse in the opening round of the playoffs but were pummeled by Boston (4-1) in the divisional finals. Graboski was holding steady with his production, but at age 28 he was already a veteran of a decade of professional basketball. Given the roster chaos, the Warriors completely collapsed in 1958-59 missing the playoffs, but help was on the way the next season. That aid would prove vital for the team, but fatal to Graboski’s days as a starter. With the arrival of Wilt Chamberlain in 1959-60, Graboski moved back to the bench for the first time since his Chicago Stags days as a teenager. That doesn’t mean the veteran was washed up just yet, though. In February that season, Wilt was out after being elbowed in the mouth and losing some teeth, so Graboski returned to the starting lineup and lit up the St. Louis Hawks with 36 points. The cagey veteran continued to provide sporadic reminders that he was still useful the next year, just like your local goggled, pot-bellied hoopster at the YMCA. 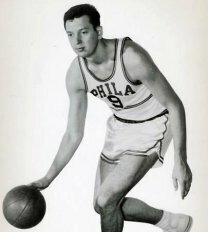 In November 1960, Graboski drilled a 25-foot set shot with two seconds left to lift Philly to a 101-99 win over New York. Then in January 1961, in a nationally televised game no less, Graboski came through with 29 points in a 114-108 victory. But come playoff time the real, hard truth was revealed: Graboski was just a bit player. The Warriors returned to the Eastern Division Finals in 1960 and lost 4-games-to-2 (a mere two points decided the final game) to Boston. Graboski scored 0 points in Game 6. In the 1961 playoffs, Graboski played a grand total of 1 minute.